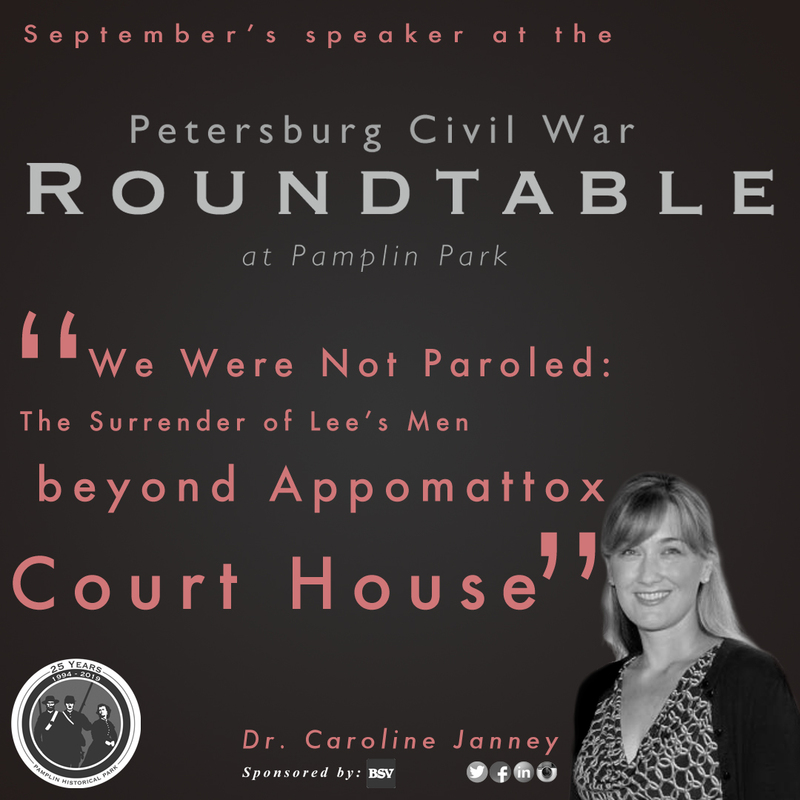 Join this month’s guest speaker Caroline Janney, Professor of History of American Civil War at the University of Virginia as she talks about “We Were Not Paroled: The Surrender of Lee’s Men beyond Appomattox Court House”. Dr. Janney is the director of the John L. Nau III Center for Civil War History at the University of Virginia . A graduate of the University of Virginia’s doctoral program, Janney most recently taught at Purdue University. She is the author of two outstanding works in the field of Civil War studies, Burying the Dead but Not the Past: Ladies’ Memorial Associations and the Lost Cause and Remembering the Civil War: Reunion and the Limits of Reconciliation, both published by the University of North Carolina Press. She also has edited two volumes of essays, published numerous scholarly articles, and is completing a study of the demobilization of the Army of Northern Virginia. Dr. Janney received both the Charles S. Sydnor Award and the Jefferson Davis Award for for her work, Remembering the Civil War: Reunion and the Limits of Reconciliation. 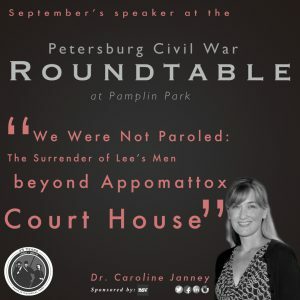 The Petersburg Civil War Roundtable (PCWRT) will meet the first Thursday of each month (except June, July, and August) at Pamplin Historical Park and the National Museum of the Civil War Soldier from 7:00 pm-8:00 pm. Annual membership is $40.00. Individuals who are already members of Pamplin Historical Park can become members of PCWRT for $20.00. Non-members can attend for $5.00 each meeting. Call (804) 861-2408 for more information.